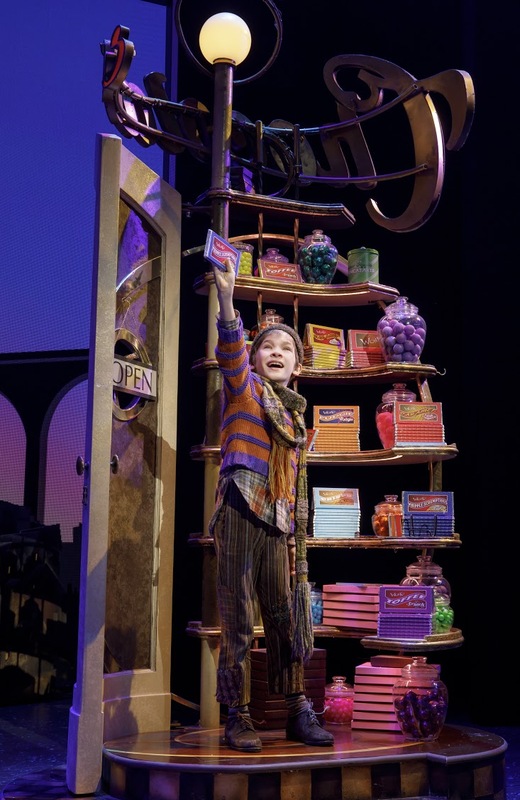 Roald Dahl's classic tale of gluttony, invention, and Oompa Loompas has been turned into a Broadway musical, and I don't think that I am stretching it by saying that it is a sweet and airy confection that is delicious to consume and will leave no deleterious effects on your waistline. The story itself has become a classic. A 2004 study found that it was a common read-aloud book for fourth-graders in schools in San Diego County, California. A 2012 survey by the University of Worcester determined that it was one of the most common books that UK adults had read as children, after Alice's Adventures in Wonderland, The Lion, the Witch and the Wardrobe, and The Wind in The Willows. (This was on Wikipedia, so I really hope it's true. Of course, it started as a book (and it's actually two books! Charlie and the Chocolate Factory (1964) and Charlie and the Great Glass Elevator. (1972) In 1971 it was turned into a movie Willie Wonka & The Chocolate Factory, featuring the inimitable Gene Wilder, and then the movie was remade again in 2005, featuring Johnny Depp. An operatic version (The Golden Ticket) was created in 2010 and in 2013 the Broadway musical premiered on the West End in London. It's also been made into a video game, a children's play, and lots of other adaptations. SOME OF THE PREVIOUS SOURCE MATERIALS. Click the picture to view the original books and movies on Amazon. We saw the touring production in Chicago (now on through October 21) and it is delightful. It's changed quite a bit from the Gene Wilder movie and the books (the idea of spies trying to hold onto Wonka's secrets has been toned down significantly) Instead the musical plays up the wonder inside of the Chocolate Factory, and how Charlie is the right kid to become the successor to the Wonka throne. When I think of the original movie, I don't think of it much as a musical-- but it certainly is. 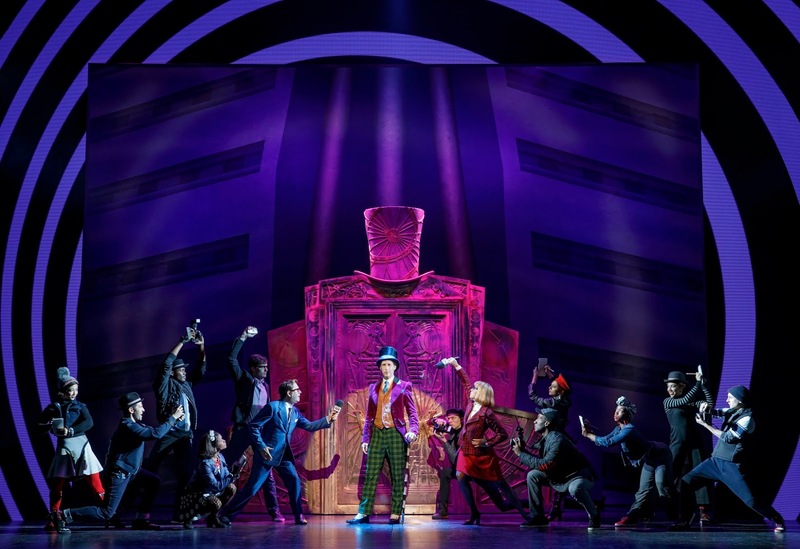 There are a number of great songs, including "The CandyMan", "Golden Ticket", and "Pure Imagination" These are all brought back for the musical version, along with some original song to fill it out as a musical. The other songs from the original movie that are memorable are all of the Oompa Loompa songs. 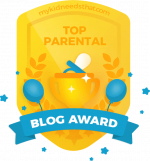 They didn't make the cut in the Broadway musical (although there is a nod to them) There are Oompa Loompa songs, and they do make commentary on the spoiled children's foibles, but the songs are very different. 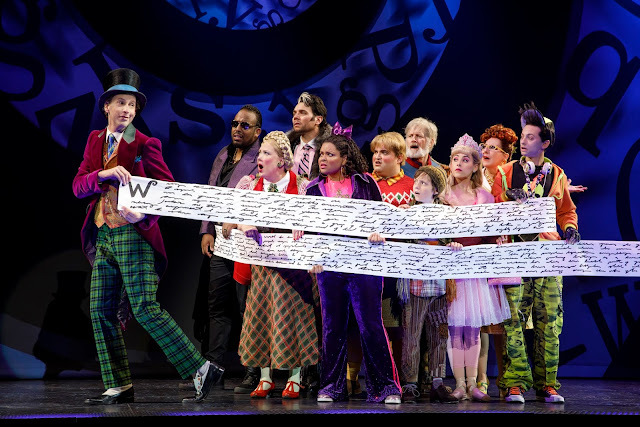 The remaining songs are peppy and deftly written by the composer responsible for Hairspray. The Oompa Loompas are also handled very differently than the movies--they are a very inventive amalgamation of puppet techniques that work beautifully. I don't want to give too much away, but they are surprising and delightful. They were created by Obie and Drama Desk Award winner Basil Twist. 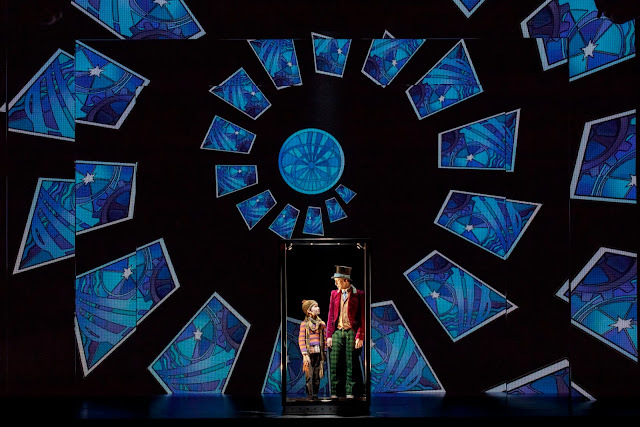 Enter the world of imagination with Charlie and the Chocolate Factory. Photo provided by production, by Joan Marcus. The main characters are all portrayed very well. My 10 year old son saw the musical and said "The characters are overdone, but not TOO overdone. Just perfect!" I think he hit it just on the head. the world of the play is fantastical, and not realistic, but it's realistic enough for us to recognize as our world. Cartoonish, but not cartoons. A lot of that has to do with the acting, but also the costuming, and the directing, and the set design as well. All of it works towards a great effect. 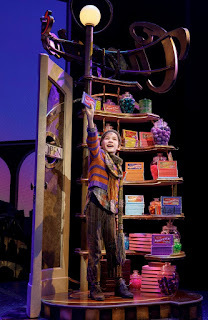 Noah Weisberg plays Wonka in the touring production, (The Broadway cast album has Christian Borle) and Weisberg is fine in the role. It's tough to fill the shoes of either Wilder or Borle, and Weisberg is peppy, snappy, and a good dancer. There are three actors playing Charlie (which makes sense, as it is quite a demanding role) I joked to my wife that in some ways, Charlie could become the boy's equivalent to the role of Annie. The boy we saw Henry Boshart, was really great. Really, there were no poor actors in this show. The quality of these touring productions are quite high. In short, this is a lovely show to bring your family to and revisit this classic story. The contract that the winners must sign. You get a good sense of the world they are in from this photo by Joan Marcus. The show will run through October 21 at Chicago's Oriental Theatre, 24 West Randolph Street. 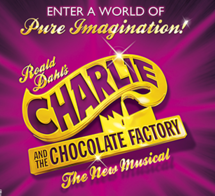 Individual tickets for Roald Dahl’s CHARLIE AND THE CHOCOLATE FACTORY start at $27 with a select number of premium tickets available. 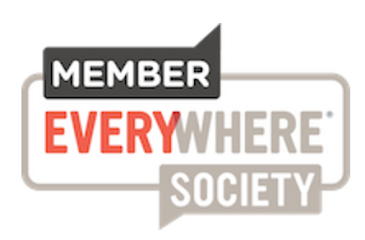 If you have a group of 10 or more, there are group rates as well. For more information, visit www.BroadwayInChicago.com. You can also look at http://www.charlieonbroadway.com for more videos and where the tour is going next.